Home > Guitars > Top Tips for choosing your first guitar? Top Tips for choosing your first guitar? Choosing your first guitar is difficult as there are so many makes and models to choose from. Ultimately the choice will vary from one person to another. However, to help you in the process of making that decision we have written this brief article which we hope you will find full of useful and practical tips for choosing your first guitar. Ultimately choosing your first guitar can be an extremely daunting experience. I remember well the day I purchased my first guitar, the fear of actually going to the music shop put me off buying for some weeks. Once I had actually plucked up the courage to cross the threshold of the guitar shop the paranoia of thinking everyone was laughing at my ham fisted attempts at playing brought me out in a cold sweat. So I understand the anxiety that many will feel. Therefore my aim with this article is hopefully to help settle some of your fears and re-assure you that even the guitar legends, had to buy their first guitar, and although they might have turned out quite good in the end I can guarantee their first strum was just as tuneless as yours and mine. Before you even set foot in the guitar shop the biggest question to ask yourself when choosing your first guitar is should you buy an electric or an acoustic? A good way of answering this question is to consider the type of music that you are interested in, and therefore the type of music that you want to play on your new guitar. Do you love blues, rock or metal, then it is probably best to buy an electric guitar. If folk or classical music is your thing then an acoustic is more what you should be considering. Do you want to be portable and be able to strum your guitar no matter where you are, well the old acoustic has all the advantages over an electric guitar. However, there are a number of additional advantages of buying an electric guitar over an acoustic, the biggest being that they are generally easier to learn to play. The solid body, generally contoured to fit that of the player, makes it more comfortable to hold. Furthermore the neck on an electric guitar tends to be narrower and the action, or height of the strings from the fretboard, is lower saving your fingers and therefore yourself a lot of pain. However, the obvious drawback of an electric guitar is the requirement for an amplifier however you can get some very reasonably priced starter packs which include all you need to get started including the amp, we review some great ones here. Next up is setting your budget! Once you have decided whether it is an electric or acoustic the next step is to set your budget and do some research. When starting out budget is quite an important consideration. My advice is a bit like the strap-line in Goldilocks and the Three Bears, you don’t want to spend too much money but equally you don’t want to spend too little on your first guitar, you have to spend just the right amount. What is the right amount? 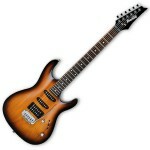 In my experience you can pick up some very good guitars for between £100 to £200. If the guitar is below £100 you have to start questioning the quality of build. As for spending too much well you don’t know if it is something that you are going to stick with so do you really want to blow £300 to £500 on something that you will use for a few weeks and then it will sit gathering dust in the bedroom. The benefit of not spending too much on a guitar is that you can try it out, if you like it and progress you can always trade up to a more expensive guitar as your skills improve. Often you will be able to part exchange your old guitar for your new one or with the help of Ebay you can easily off-load your old instrument. Research is my opinion is invaluable. But you need to do it before you set foot in the guitar shop, as it allows you to clarify what you are looking for in a guitar. Before you set out to purchase, get an idea of prices for the type of guitar that you are after, this will put you in a better position when you are in the guitar shop. Check for customer reviews of the models that you are interested in, is there a better equivalent recommended. Finally try out the guitar that you are interested in before you buy it. You might not want to, especially if you are a complete novice, but don’t be put off, give it a go as it is important to test the guitar. Does it feel comfortable to play. Check the guitar for signs of wear and tear or flaws in the build quality. If you are buying an electric guitar plug it into an amplifier and try it both clean and distorted. Does it stay in tune, play with the tone and volume controls, do they work, does the sound crackle when you turn the volume up or down. If there is anything that you are unsure about ask as the store owner, if they are good, they will answer all your questions, after all they want to sell a guitar to a happy customer. If you are happy with the guitar, remember the research that you did. Is the model cheaper to buy on-line. If it is ask the store owner if they are willing to match the price. If they aren’t then perhaps consider buying on-line at the cheaper price. If you are looking for a good place to start then check out the following great guitars that we have reviewed on Top Guitars. We think all of these are great guitars and all come in at under £200. Epiphone Les Paul Special II. The perfect beginners guitar? Remember when buying a guitar, as with any other major purchase, preparation is the key to getting yourself a great deal. Until next time happy strumming. What is the Top-Guitars Top Guitar?